300 Channels that I can Pick and Still Nothing on! In today’s Speech from the Throne the Harper Government as a part of their consumer first agenda, announced plans to force cable and satellite companies to offer “el la carte” or “pick and pay” options for TV channels. My question to the Harper Government is why are they interfering in the cable TV Industry for no particular reason? Where have they been on this issue for the last 6 years of their mandate? What has changed in TVland that now demands their intervention now? Without knowing all the details of the eventual legislation, there are a few fundamental problems with their plans for the cable/satellite television industry. Will it Lower Basic Cable Bills? First, It is likely that, basic cable packages will likely remain the same. You will still receive the staple channels that you are familiar with: CBC, CTV, Global, CSPAN etc., as well as your big American networks most of which you can get over the open air broadcasts anyways. There is no reason why those individuals or businesses who purchase just basic cable will see a cheaper cable rates as bundles tend to be for premium/specialty channels and add-ons to basic cable packages. As a result you are still likely to see at least $30-$40 a month (Rogers, Cogeco, Bell) once any introductory discount expire. Of course this means that the pick and pay model for premium channels will be charged in addition to the basic rates. Even if people are able to pick their basic cable channels, unless the government is willing to command a pricing structure on the cable companies there is little reason to expect companies to charge a lower rate for individuals selecting fewer basic cable channels when they are the most “basic” packages. 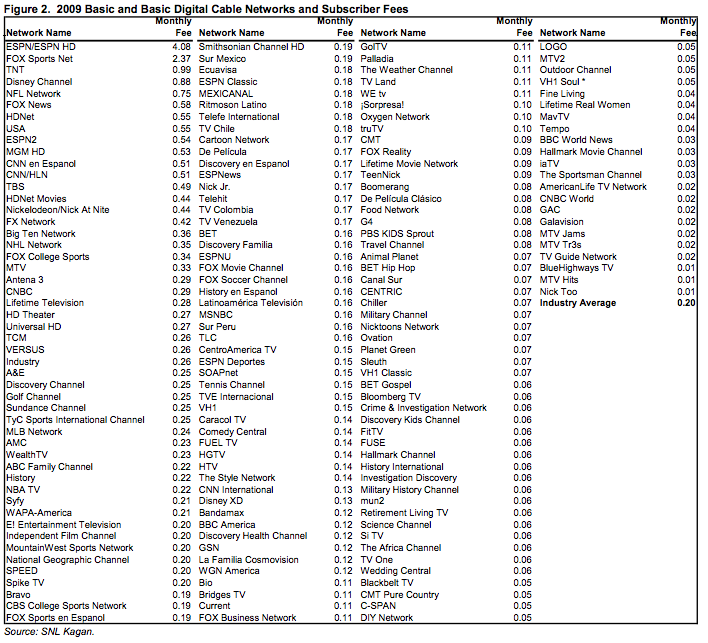 The Channels I want Will be More Expensive… Assuming They Are Still on the Air. Although people think that picking the channels they like will lower their bills, that may not be the case. The justification that cable/satellite companies provide for bundling channel packages is to lower the costs of the channels. Cable companies pay the broadcasters for the right to provide their channels. Although I couldn’t find the costs per channel in Canada for cable companies the charges in the US in 2009 can be seen on the right. Although those prices are wholesale and are unlikely to be passed on to consumers without markup you can see can the potential savings. Unfortunately there is a catch, current channel bundles group a variety of channels together and in turn lower the cost of purchasing these channels by service provider due to their purchasing power. If you bundle ESPN and the Disney Channel together (channels that I would assume have different types of viewership) basically the cable company can add two distinct groups of viewers together and tell the networks that they can advertise to the total viewership of those two channels. In turn the networks can tell companies who advertise with them that their advertisements will reach the larger population and more diverse demographics. If the bundles are broken up by government action (likely via the CRTC), it will mean that networks will be unable to tell advertisers that there products will be seen by more people. In turn, the networks in order to maintain their profits will increase the individual cost of their channel when they sell the right to air to the cable and satellite companies. This higher fee will then be passed on to the consumer meaning that the channels that a they want to see, will cost more on an individual basis. For some niche channels there is another possible consequence beyond higher costs, The breaking up of bundles could result in certain channels no longer being financially viable. The new model of programming means that that fewer viewers would be forced to purchase the channels in their cable packages. The result would be lower subscriber numbers and advertising revenues both of which could result in the dropping of these channels from cable options meaning less choice for consumers and fewer options for creators of television programming. It Doesn’t Help Those Who are Unplugged. Over the past few years thousands of Canadians have unplugged from the Cable/Satellite companies turning to for open air HD broadcasts, the Internet and Netflix for their entertainment. In full disclosure, this is the option that my household has opted for. From my little aerial in Windsor Ontario, I pick up over a dozen channels. I get NBC, ABC, CBS, PBS, CTV, CBC, FOX plus a handful of local channels from south-eastern Michigan (note some adjustment to the aerial that requires me getting off the couch is needed to pick up some the channels) . At a cost of $0 per month, I watch Football on Sundays, Hockey on Saturdays and I see all of the major network programming. Through my Xbox I can stream Netflix and using it as a media hub I can also watch media from the internet on my TV. The Harper government consumer first approach won’t get me to buy unbundled cable or satellite services and I am willing to bet that few Canadians who have unplugged would come back either. By interjecting themselves into the cable market, not only are the Conservatives betraying their principles of letting the free markets act freely, they are just creating new market inefficiencies that will cost consumers more and probably won’t win any new votes. Let’s all accept what this announcement really is, mindless pandering to a political base who isn’t properly informed on the issue. I have no doubt that they will put one favorite channel in bundle and we will be paying even more when they are done. They have already done that breaking up sport channels with some providers.